See here how you can schedule a campaign to be sent in another date or time. Scheduling your campaign is the last step after creating your campaign. Once you're happy with the layout and content of your campaign (ie. previewing your campaign and sending some test campaigns), click on the Next button on the top right corner of your Campaign Editor. You can review the details of your campaign before sending it (ie. email subject, number of recipients, etc.). This is also where you will see the cost of the campaign. After you make sure you have the correct details, at the bottom you'll see two options, Sent Test and Schedule. Click on Schedule to schedule your campaign. This is where you will choose when you'd like this campaign to be sent. You can choose a different Delivery Date and Time based on the chosen Timezone. You will also see a checkbox that is not yet enabled for the Timewarp, where you'll be able to send the campaign according to the recipient's timezone. Take note that this feature is still in the works and should be available soon. 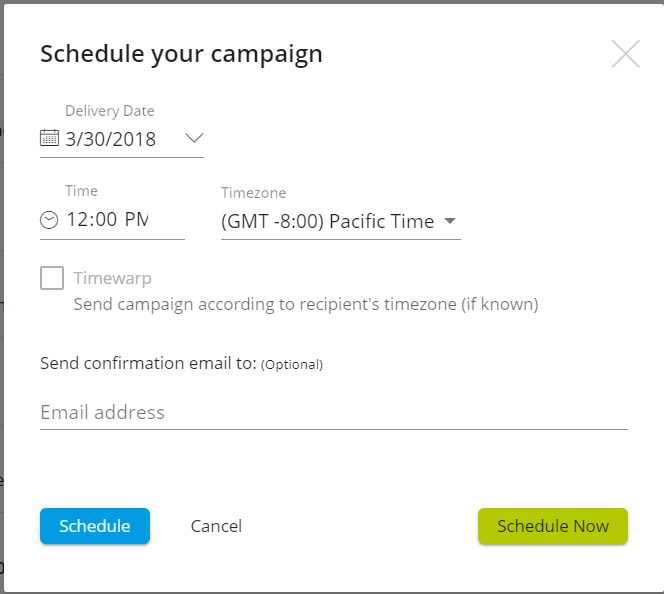 Once you've chosen the desired date and time you'd like to send your campaign, there is an option to input your email to receive a confirmation once the campaign is sent. Another option is to simply send it right away. To do that, you can just click on the Schedule Now button and the bottom right corner of the pop up and your campaign will be sent right away. Tip: Make sure you Send Test campaigns or preview your campaign before scheduling your campaigns to see what your campaign would look like.